The Mouse You Can Trust! I have been seeing silverfish recently in my home. Can they ruin my clothing? 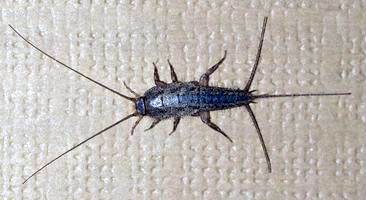 Silverfish and their cousins the firebrat eat a wide variety of foods, including glue, wallpaper paste, book bindings, paper, photographs, starch in clothing, cotton, linen, rayon fabrics, wheat flour, cereals, dried meats, leather and even dead insects. These pests have flat, elongated bodies and are about ½ inch long. They resemble a "carrot" shape with a broader head and more slender tapering toward the rear. They do not have wings, but are covered with scales and have two long slender antennae at the head and three antennae appendages at the rear. They can frequently be found in bath tubs and sinks unable to climb out. They prefer dark places that are damp and cool and often are in the basement, bathroom, and kitchen. These insects normally hitchhike into homes in food, furniture, old books, papers and old starched clothing. If you have a large infestation that usually means they have been in your home for some time. As for what you can do, start with sanitation, remove old stacks of magazines, papers, books and fabrics plus foodstuffs spilled and stored for long time. Reduce available water supply and lowering your home's relative humidity with a dehumidifier or fan, even lighting a dark storage area can help. Once the infestation has been eliminated, sanitation will prevent re-infestation. In extreme cases where these pests may reside in insulation or wall voids, you may want to contact a pest control company. Treatments will be applied to potential hiding places including cracks and crevices, inside floor moldings, around plumbing pipes and behind seldom moved furniture, closets, and even attics. Sometimes wall voids are also treated. Since the silverfish must contact the insecticide it can take up to two weeks for your Enviroguard pest management professionals to control them.